While bath time might be seen as a joy to some children and a chore for others—there’s no getting around it, the activity is a daily (or weekly) duty for most families. So, why not make it an extra-fun occasion with the very best bath time essentials for kids? Inspired by Sago Mini‘s brand-new Easy Clean Bath Squirters—whose characters’ heads pop off so that parents can open, clean, and dry them in order to prevent mold build-up—we’ve gathered a handful of our favorite modern and safe bath time accompaniments that’ll take your splash-happy routine to the next level. Unfortunately, mold and bath time squirters tend to go together like peanut butter and jelly. Which is why Sago Mini has recently introduced an innovative new product—Easy Clean Bath Squirters in the likeness of some of the brand's beloved characters (Harvey, Jinja, Robin, and Jack) and featuring simple to twist-off heads, allowing parents to drain, rinse, and dry out the animals between suds sessions. 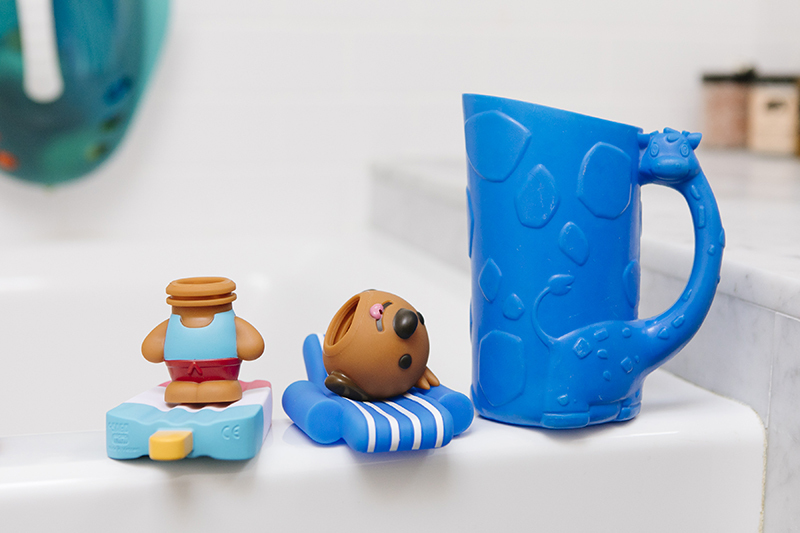 Bonus points: Each animal comes with a festive floaty for maximum pool party (er, bath party) vibes. Sago Mini Easy Clean Bath Squirters and Floaties 8-Piece Gift Set, $24.99, Amazon. Watch out, ma! These characters were built specifically with little toddler and preschooler hands in mind, making them simple for the littlest of digits to squeeze and squirt. 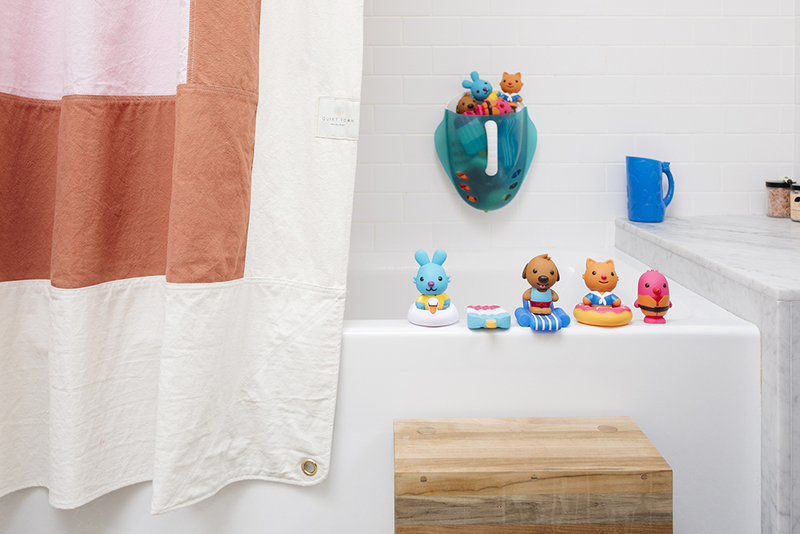 Now that you've got your mold-resistant bath toys sorted, where do you store those little guys between baths? We love this caddy that allows folks to scoop up all of the toys at one, while doing a first-over drain-out at the same time. 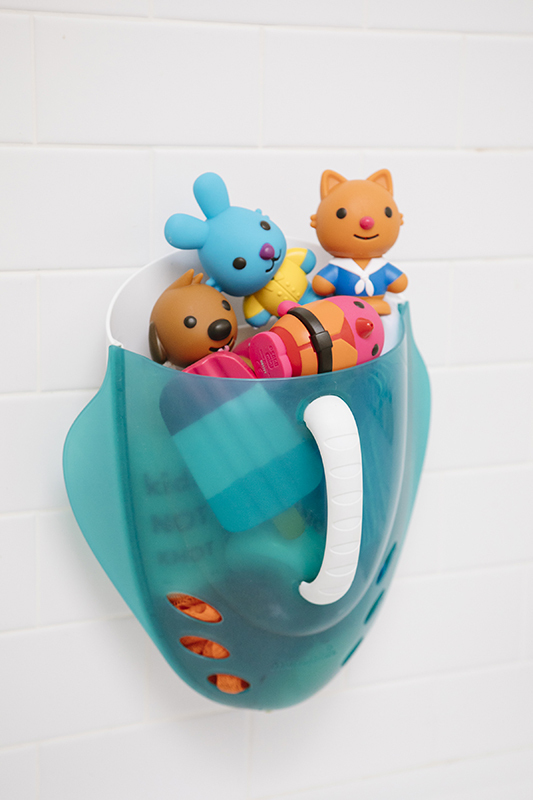 Once all of your squirters and other toys have been individually drained and dried, simply store them in this wall-mounted caddy until next time. Munchkin Scoop, Drain, and Store Bath Toy Organizer, $14.95, Amazon. There's a reason bubble bath is an absolute classic—everything is just that much more fun when bubbles are involved. For those looking to up the ante, try switching up your regular bubble bath routine with a colored bath bomb from time to time to give your kids another reason to run to the tub. Tubby Wonderland Lignonberry Frost Bubble Bath, $15, Tubby Todd. Tubby Wonderland Woodland Vanilla Hair & Body Wash, $15, Tubby Todd. Bath Bomb Bundle, $25, Tubby Todd. A step stool is a versatile item in the family bathroom. Find one that can play double-duty as a seat for mom or dad during bath time duty, and to help minis wash their hands and reach the sink while brushing their teeth. This particular one is so sleek it could easily travel around any room in the house and not look out of place. Teak Step Stool, $128, Serena & Lily. One reason some little kids loathe bath time is the very real fear of getting soap in their eyes while washing their hair. This soft and super-flexible rinsing cup helps end this problem before it begins by gently hugging and molding to the shape of your child's forehead, cupping it and keeping soap and water out of his or her eyes during shampoo sessions. Munchkin Rinse Shampoo Rinser, $4.95, Amazon. Bath time over already? Keep your little ones warm and dry and entice them to exit the tub in a timely manner with a hooded towel in any animal or character of their choosing. Apple Park Organic Hooded Baby Bath Towel, $39, Amazon. 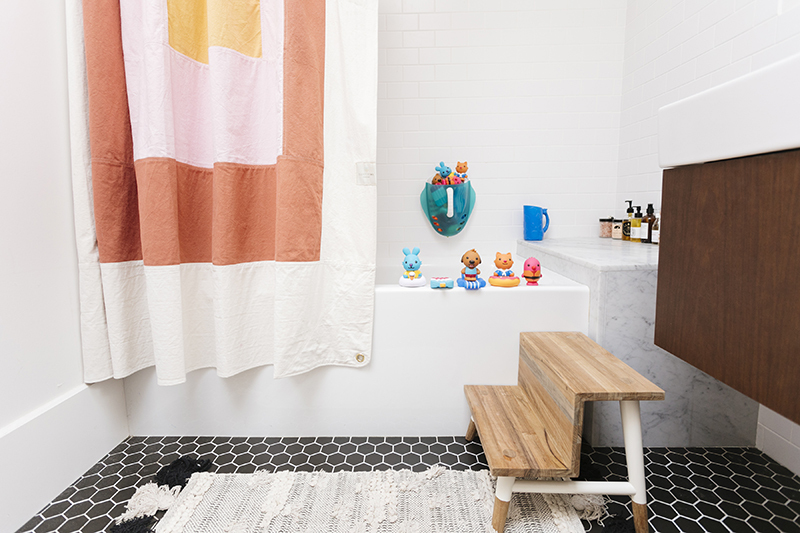 While they're not exactly kid essentials, some other features of Angela Tafoya, Eric Bailey, and toddler Tallie's bathroom that we absolutely love include these bold and graphic elements. The Marfa Curtain, $198, Quiet Town. Quincy Handwoven Rug, $45, Pom Pom At Home.